Select the groups you need in the Ad groups tab. You can instantly select several groups by holding the Ctrl or Shift keys. Keywords from all the groups you select will display in the Phrases tab. 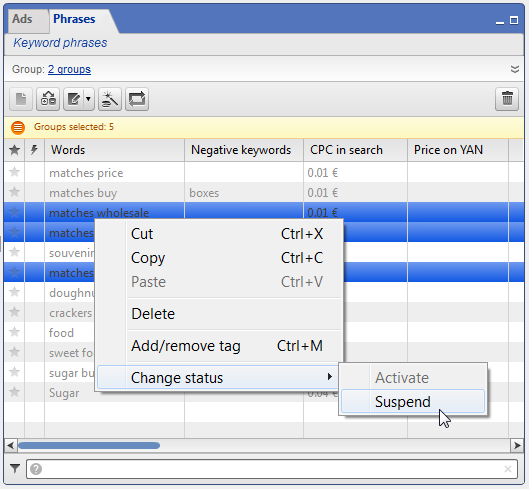 Under the Phrases tab, select the keywords that you want to suspend or activate. Right-click on the selected keywords in the context menu and choose either Change status → Suspend or Change status → Activate. You can continue to change a keyword's status until it is sent to the server. 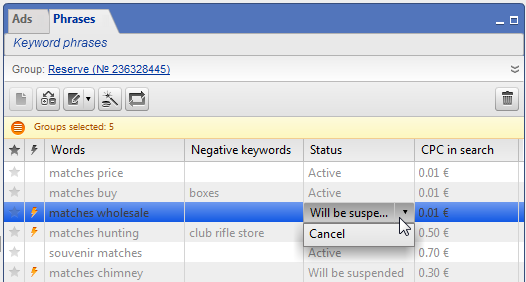 Just double-click on the Status column and choose Cancel.